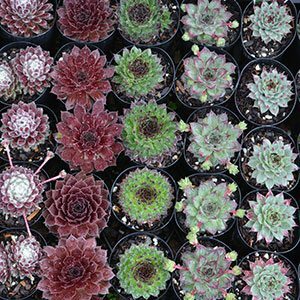 With the increasing interest in Succulents, grower of wholesale succulents are offering an ever increasing range of plants for mass planting in commercial landscaping as well as for garden centres. A range of succulents plants are offered by wholesalers both for the retail nursery industry and increasingly for landscapers and green roof construction. Offered as mature plants as well a younger plants in trays, either mixed or of one variety. Pictured we have a tray of mixed varieties ready to be dispatched. Bulk orders may need to made in advance to ensure supply and delivery for larger projects. Succulents include a very wide range of plants including Aeonium, Crassula, Jade, Sedums, Sempiverum, Echeveria, Lithops and many others. Some growers are active importers of new and interesting varieties from Japan, China and Europe.